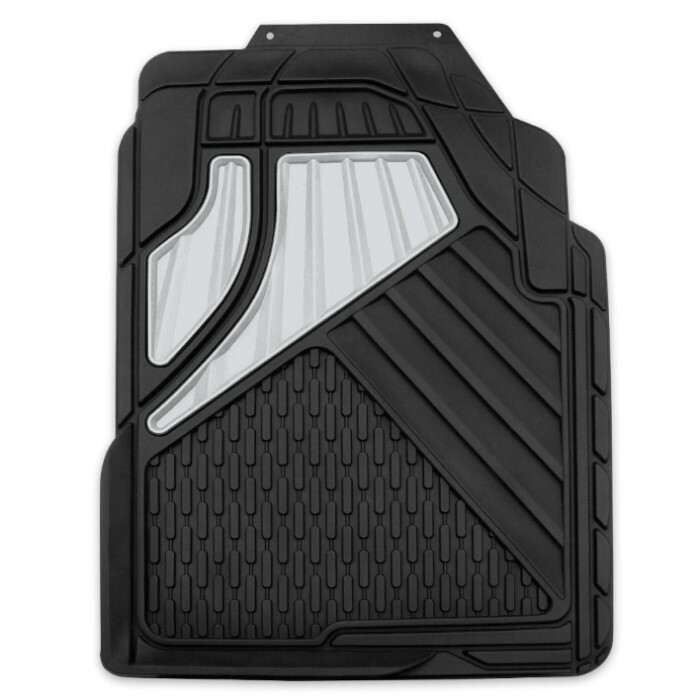 GoGear 4-Piece Heavy Duty Auto Floor Mats - Full Size Trucks, SUVs and Crossovers - Black | BUDK.com - Knives & Swords At The Lowest Prices! 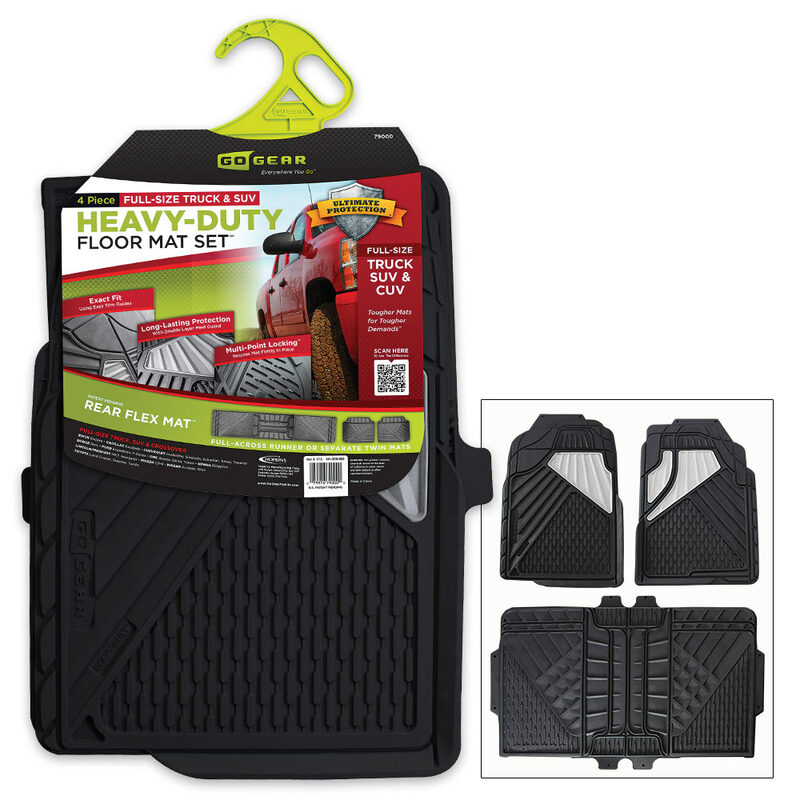 GoGear Heavy Duty Truck, SUV and Crossover Floor Mats offer the same seamless fit, unrivaled protection and incredible long life of custom built mats, without the hefty custom pricetag! Designed for maximum coverage, this four-piece set won't leave a single patch of floorboard carpet exposed. Each mat features handy trim guides that allow you to tailor the fit to your vehicle's unique floor area and contours. Rear "Flex Mats" allow you to choose protection that is best for your vehicle - full/across runner or separate/twin mats. 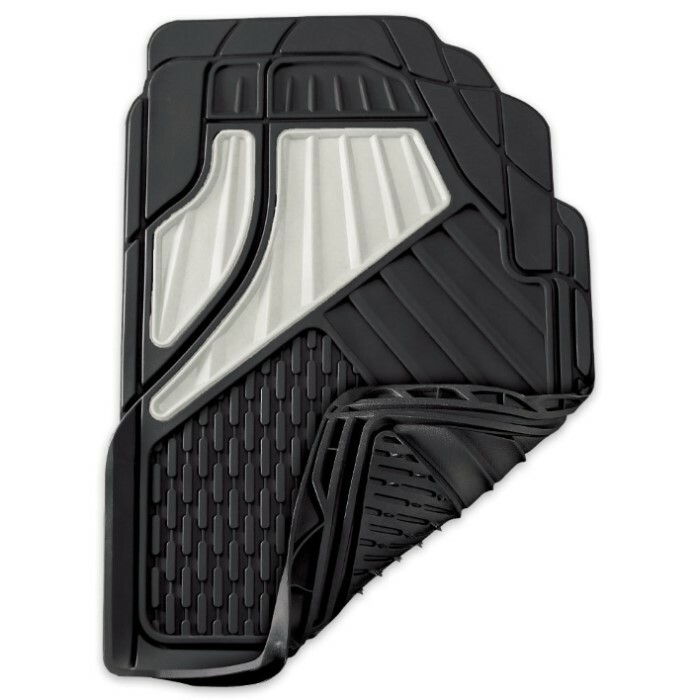 The double-layer heel guard provides up to 57 percent more protection where mats endure the most wear, so you can rely on every square inch of each mat, even in the dirtiest, harshest conditions. With up to three times the holding power of similarly priced mats, GoGear mats won't shift and are, thus, safer than the competition. Each mat boasts multiple independent locking mechanisms for a fail-safe hold you can trust. Spike-style anchors at the top keep your mat from rolling back onto pedals, and cleat-style anchors fill out the rest to prevent forward sliding. The driver mat even boasts an additional "hook and loop" attachment system for unmatched security. Dirt and grime stays hidden against the black color scheme, and each mat is easy to clean. Engineered for full size trucks, SUVs and crossovers, including: Buick Enclave; Cadillac Escalade; Chevrolet S10 and S10 Blazer, Silverado, Avalanche, Suburban, Tahoe, Trailblazer and Traverse; GMC Sierra, Yukon and Acadia; Dodge Ram 1500 and Durango; Honda Ridgeline and Pilot; Ford F-150, F-250, F-350, Excursion and Expedition; Nissan Titan, Armada and Murano; Toyota T100, Tundra, Land Cruiser and Sequoia.